Not only is this a great recipe to make with the kids with lots of mixing, grating and rolling involved, it has the added bonus of sneaking an extra serve of veggies into one of their favourite treats - winning! 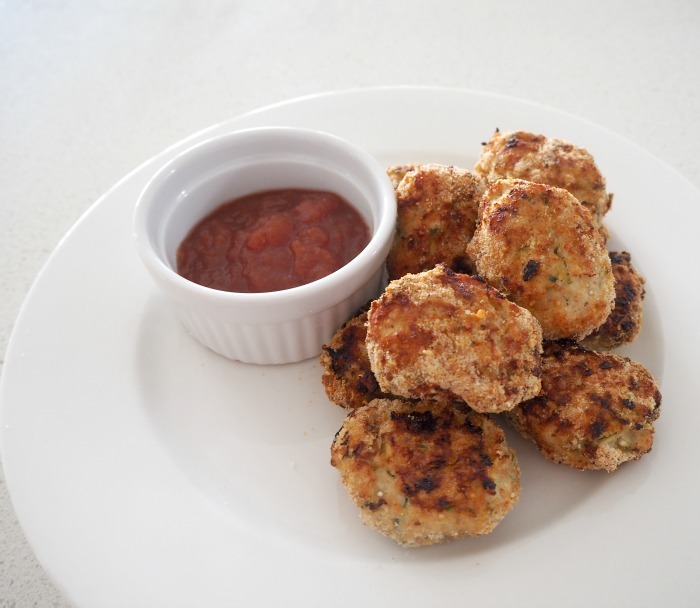 By cooking these nuggets in the Kambrook Chef Air Frying Oven, we only need to add the smallest amount of oil to achieve a yummy crispy coating around our nuggets which my kids loved! ½ cup of very finely grated parmesan cheese – use the finest setting on your grater. Use the finest setting of your grater to grate the cheese and place into a small bowl. Chop the parsley finely and place it along with the bread crumbs into the bowl with the cheese. Set aside until needed. Place the water and quinoa into a small saucepan and cook over a medium heat until all the water has absorbed and the quinoa is light and fluffy. Remove from the heat and allow to cool slightly. Grate the zucchini into a large bowl before adding the chicken breast mince and the cooked quinoa which has been cooled slightly. Using a large spoon to mix together all the ingredients until they are combined. Use another metal spoon to scoop the chicken mixture and roll into balls with your hands. Place the chicken balls into the bowl with the breadcrumb mixture and lightly toss to cover the entire ball. Place the coated chicken balls onto a large plate and using the palm of your hand, slightly flatten the ball before using the knuckle of your thumb to indent the side – giving you the shape of a ‘traditional’ chicken nugget. Repeat this process until all the chicken mixture has been used. Preheat your Kambrook Chef Air Frying Oven to 190 degrees and lightly spray with oil. Fill the tray of the Chef Air Frying Oven with your Chicken and Zucchini Nuggets and cook for 10 minutes before using a pair of tongs to turn the nuggets and cook for a further 5 minutes or until your nuggets are cooked through. Repeat the cooking process until all the Chicken and Zucchini Nuggets has been cooked. If you are looking for an easy cake recipe to put together with the kids, these Mini Banana and Raspberry Cakes are for you! There are lots of jobs for the kids to get involved with - mashing, mixing and of course taste testing as they go! This recipe makes two 9 x 9cm cakes, perfect for a yummy morning or afternoon tea with the kids! Cooking these gorgeous cakes in the Kambrook Chef Air Frying Oven was so easy and as it’s up on the kitchen bench, it prevents little people from trying to open the oven during the cooking process. Lightly grease and line the base of 2 x 9cm square cake tins. Melt the butter and set aside to allow it to cool slightly. Mash the banana and set aside until needed. Sift the self raising flour into the bowl of your Kambrook Stand Mixer before adding the caster sugar, egg, milk, vanilla essence, cooled butter and mashed banana and mix on a low speed until ingredients have just combined - it’s ok if the mixture is still a little lumpy. Remove the bowl from the stand mixer and add the frozen raspberries and gently fold through with a large metal spoon. Preheat your Kambrook Chef Air Frying Oven to 160 degrees. Divide the mixture between your two cake tins and place one into your preheated Chef Air Frying Oven and bake for 20 minutes. Check your cake with a wooden skewer to make sure it’s cooked through, if not cook for a further 5 minutes. Repeat the above step to cook the second cake. Serve cakes as is or ice with simple icing. These cakes can also be frozen for up to one month. My kids like to call these ABCD Muffins (Apple, Banana, Cinnamon and Date Muffins) ‘Alphabet Cakes’ thanks to their fun name! This is a great recipe to make with the kids as not only are there lots of jobs for them to do - grating, mixing, pouring etc but it’s a good way to talk to them about what goes into the food we eat. You only need to mix these ABCD Muffins for a minute or two in your Kambrook Stand Mixer as over mixing will cause the muffins to become rubbery and hard. To make these muffins a little extra special you can also sprinkle them with a little coconut before baking - yum! Preheat your oven to 200 degrees and line a 12 hole muffin tray with paper cases. Mash the bananas and grate the apple, set aside until needed. Sift the self raising flour into the bowl of your Kambrook Stand Mixer before adding the caster sugar, egg, milk, vanilla essence, cinnamon cooled butter and mashed banana and mix on a low speed until ingredients have almost combined. Add the grated apple and chopped dates and mix on a low speed until just combined. Remove the bowl from the stand mixer and divide the mixture into the muffin cases. Bake the muffins for 20 minutes or until they are golden and cooked through. Carefully remove the muffins from the oven and allow to cool in the tray for 5 minutes before transferring to a wire rack to cool completely. This easy Fried Rice recipe has so much going for it, it’s family friendly, tastes great and as you don’t need to order takeout anymore, it will save you money! My kids love to help me make this and it’s a great conversation starter to talk to them about what goes into our food, different types of vegetables and how they are good for us. All it takes is 10 minutes of preparation to get this Fried Rice ready before the Kambrook Rice Cooker takes over and cooks this rice to perfection - perfect for those busy nights with the kids! Heat a large frying pan over a medium to high heat and heat the olive oil. Add the bacon, spring onions, capsicum and corn kernels and cook for 2 minutes before adding the grated carrot and cashews and reducing the heat to medium. Add the rice and mix through the pan before cooking for 3 minutes. Add the chicken stock, water, soy sauce, sweet chilli sauce and honey and bring to a simmer before cooking for 3 minutes or until the liquid begins to reduce. Carefully transfer the contents of your frying pan into the Kambrook Rice Cooker non stick cooking bowl and close the lid. Set the control lever to ‘Cook Rice’ and cook until the unit automatically switches to the ‘Keep Warm’ function. Carefully open the lid of the Rice Cooker and stir the contents before closing the lid and leave the rice to continue to absorb the liquid and keep cooking. Check the rice after a further 6 minutes and serve once cooked.